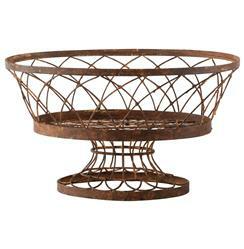 Hand-aged rust gives these pedestal-style baskets an aged patina. The round receptacles offer artistic spaces to showcase flowers, fruit or freshly-baked bread. Together or separated, these iron sculptures add elegant, antique elements to your environment. Powder coating protects the basket from the elements, but aging will occur if used outdoors.